The New Doctor Who Review: Doctor Who - "Human Nature"
In this blog, I will review every new episode of the revived Doctor Who series, and express my opinion on how well I feel they stack up to the standards set by the original series. In addition to a review, each episode's approximation to a classic-style Doctor Who episode will be ranked on a scale of 1 to 10. 1 being a complete departure from what we expect Doctor Who to be, and 10 being 45 minutes of solid classic-style Doctor Who. Doctor Who - "The Doctor's Daughter"
Doctor Who - "Human Nature"
My score of this episode may surprise some of you, but I based it on the plot of the episode, the limited use of CGI, the geographic setting, the pace of the episode, and the incidental scores. "Human Nature" is actually based on the novel written by Paul Cornell back in the mid 90s, which probably accounts for the episode being so much closer to classic Doctor Who. During the 90s, the iGen and the grittiness of 2007 society had not yet gripped this world, and so it wasn't reflected in the writing of Doctor Who stories. 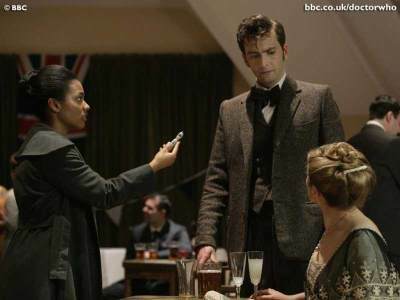 The plotline of the story has been altered to some degree to better suit the Tenth Doctor's era, but overall the mix of elements introduced to make the story work with number ten and the elements pulled from Cornell's novel seemed to be the perfect amount of ingredients for a great episode of Doctor Who. The episode is also the first of a two parter, so this allows for the story to unfold at a more natural pace, closer to the original series. At no time did the episode feel rushed, and the characters of this story have shown more courage and dignity than any character in the revived series. For example, during the dark cold night, Redfern walks alone down a path and is suddenly struck by a bright green light, as the Family seek a place to land their ship. Although she is startled, she becomes more curious than frightened - not one time does she shriek, gasps, or cry bloody murder in a fit of panic. A similar scene is where Baines is collecting his beer stash, only to be interrupted by the arrival of the Family's ship, at which point he investigates to satisfy his curiosity - ultimately leading to his capture and being the first to be possessed by the Family. The episode recalls the chameleon arch, and also introduces the fact that Time Lords can store their identity in a special fob watch. There was no over-acting by any of the characters, so any drama in the episode was natural, and wasn't forced by pepped-up presentation. There are also numerous other direct nods to the original series, particularly in Smith's "A Journal of Impossible Things." Sketches of a Dalek, Cybermen, past companions, the Slitheen, and my favorite, a sketch of the Doctor's previous incarnations; all nine of them. Ofcourse, two parters always get a few points on the Whoscale, because they're guaranteed to end in a cliffhanger, and offer tremendous nods to the original series. The ending of "Human Nature" is no exception. One of the best cliffhangers of the revived series, probably since "The Impossible Planet," the Family discover that John Smith is an alias for The Doctor, and crash the village dance. They take Martha and Redfern hostage, giving The Doctor (or Smith) an ultimatum - which one does he want to die - maid or matron, friend or lover. At that moment, a final clip of The Doctor's face is accompanied by the "sting" of the closing titles theme. The last few moments leading up to the cliffhanger wasn't action packed and wasn't blasting with orchestrated music, but the music that DID accompany the final scenes seemed to suit the mood perfectly. A brilliant episode, and if my memory serves, this was the first episode to break the 9 mark on the Whoscale since Steven Moffat's "The Empty Child/The Doctor Dances" during the Eccleston year. Doctor Who - "The Fires of Pompeii"
Doctor Who - "Partners In Crime"
Doctor Who - "Voyage of the Damned"
Doctor Who - "The Infinite Quest"
Doctor Who - "Last of the Time Lords"
Doctor Who - "The Sound of Drums"
Doctor Who - "The Family of Blood"
Copyright 2012. All text material is the property of the author. Simple theme. Powered by Blogger.